You’re scrolling through Yelp, deciding where to grab dinner. You glance at the star rating, skim a few reviews — “OMG, best ramen ever!” — and perhaps check if you need a reservation. Now, you’ll spot a new and critical piece of information on restaurant pages: Results of the county health department’s most recent inspection, complete with food safety violations, right there below the restaurant’s price range and hours. Restaurant inspection information has always been available to the public, but it’s often buried on a government website or hung on a placard at the restaurant itself. Even county apps, such as California Food Inspector, are subject to error. In 2013, San Francisco-based Yelp rolled out health scores for parts of California, including Marin and San Francisco. Now the review site has added health scores to more than 20,000 restaurant pages throughout the rest of the state, including eateries in the East Bay and South Bay. Health inspection grades will also roll out in New York, Texas, Chicago, and Washington D.C.
As the initial phase of today’s national rollout, Yelp will feature 350,000 restaurants — 39 percent of the website’s total restaurant listings — with health scores. By the end of the year, that number will grow to cover restaurants in 42 states. 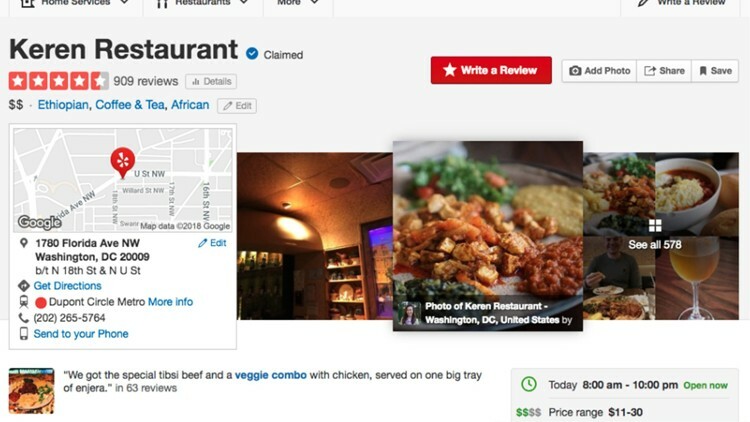 Beginning today, Yelp visitors will see a health score, computed by third-party HD Scores, and a one-line summary of violations at the very moment they’re weighing restaurant options online. Of course, it won’t be as detailed as the full report you’ll find on a county website — but it will be a lot easier to digest. Lowe says the company’s LIVES program (Local Inspector Value Entry Specification) was inspired by a 1990s Los Angeles restaurant industry study, which found that displaying restaurant-hygiene grades resulted in a 13 percent reduction in food-borne illness hospitalizations. This may make a difference, especially if you’re accustomed to going by Yelp star ratings alone. Take Andy’s Sushi in Walnut Creek. The Japanese-inspired restaurant maintains its 4-star rating despite a June 20 shutdown by Contra Costa County food safety inspectors for vermin infestation. Saaghi, a Persian restaurant in San Jose, has received a red placard and been shut down five times in the last two years for live and dead cockroaches found on its walls and floors and inside a pepper shaker, but still has a 3.5 rating on Yelp. Several California counties have made their health inspection records more readily available online, as well as easier to understand. Alameda and Santa Clara counties use color-coded health inspection placards with green indicating a “pass,” yellow for a “conditional pass” and red for a “failed inspection.” Contra Costa and Santa Clara counties also have free mobile apps with the information. Gaddi encourages consumers to check the county website and SCC Dine Out app for up-to-the minute information on restaurants, since follow-up inspections are typically done within one to three days of closures and conditional passes, she says. And when the results are positive, restaurateurs shine. What does a county inspector look for? Routine inspections are unannounced and based on federal guidelines of major risks of food-borne illness, including cross contamination, proper cooking and holding temperatures, employee health and safety. The number of annual visits depends on a restaurant’s risk level. Food facilities that do a lot of food prep, as well as cooling and holding food at temperature, are considered a Risk 3 and are inspected three times a year. Chain restaurants that receive most of their food frozen and just cook it are considered Risk 2 and inspected twice a year. Restaurants that don’t do a lot of cooking are Risk 1 and inspected once a year. If the inspector finds two or more major violations, the restaurant is given a yellow placard and re-inspected within 10 days. Vermin infestations, where vermin are found in a food storage or preparation area, are almost always cause for closure.